Home Insights Social Media Nightmare: Citibank “Has Customers Arrested.” Video Goes Viral. Now What? Social Media Nightmare: Citibank “Has Customers Arrested.” Video Goes Viral. Now What? Last Saturday, a group of protesters from the Occupy Wall Street movement entered a Citibank branch in New York City, reportedly to close their accounts. About 40 minutes later, 23 or 24 of them had been arrested by the New York City police. 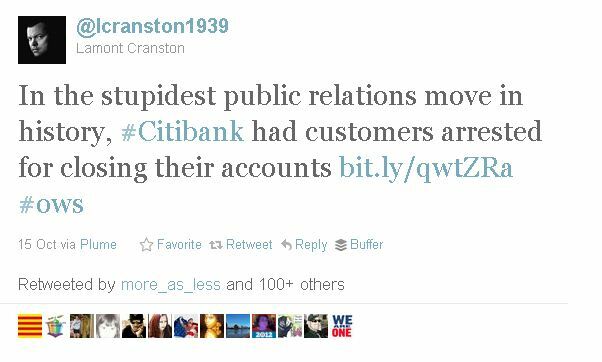 The story quickly went viral: “In the stupidest public relations move in history, #Citibank had customer arrested for closing their accounts” reads the tweet that is re-posted by hundreds of people. Two days later, a video showing some of the arrests taking place has been viewed by nearly 150,000 people. Can you spell PR nightmare? So what do you do? Let’s pretend you’re the SVP of Social Media for Citibank. On Monday, you’re scheduled to speak on a panel about the “customer experience” at PivotCon, a social media conference being held in New York this week. a) cancel your trip so you can stay in the office and manage the crisis? b) go to the conference but don’t comment on the story while legal sorts things out? c) open your session by playing the video that the protesters filmed of the arrests? If you have followed Frank Eliason’s career, you know that he has an impressive track record of leading cultural change and getting large organizations to behave in ways that are not typically associated with large organizations, especially not with those in highly regulated industries. Like banking. So, even though I have been a fan of Frank’s for years–he’s spoken at two of our conferences and is on our advisory board–and even though I have great trust in his skills as a change agent, my jaw dropped when he started playing the Occupy Wall Street video showing the protesters being arrested. Believe me: he got the audience’s attention. The SVP of a bank in the middle of a public relations nightmare was…playing the video that created the nightmare? It got me thinking really fast. About how open and courageous and transparent large companies need to be in the smartphone + social media era. The conversation is happening, whether you chose to participate in it or not. Still. It’s a courageous move for a large company to address this issue so openly and publicly. 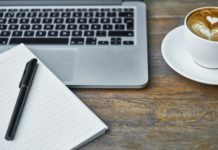 It’s easy for those of us at smaller companies or in different industries to say “but this is exactly what they should do – be honest and open and trust their customers to make up their own minds, not run and hide.” And you would be right about that. But you haven’t spent years getting approval from lawyers and regulators on every line of a press release. In fact, even Frank Eliason told me that he was “shocked” that he got the ok to play those videos in a public setting. Playing these videos at a social media conference does not make the PR issue go away. 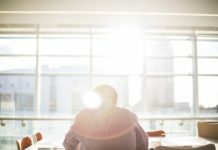 But by setting the tone that the organization is open and transparent, Citi is keeping the problem from getting worse and creating an opportunity to have a dialog with its customers and earn their trust. It would be interesting to see that dialog take place–and to see how financial institutions use social media to engage in this dialog with their customers and with the protesters. They set up their Occupy Wall Street panel in the lobby. I guess I would have had them escorted out vs. arresting them, or approach them and invite them to continue their dialogue outside. Haven’t got time to watch the video yet, but I will. I haven’t watched the Occupy side either, because I wondered what the full story is. Would have been shocked at opening with the video too. And proud. Because that means the message about being transparent and open is getting through somewhere, to companies big and small. That could indicate that there’s room for dialogue between the two parties if they can agree on a fair forum.And it’s significant, to me, that the company got to tell its side of the story – there’s always two sides to every story, and the third, rarely mentioned side, the objective truth of what happened.
.@ShellyKramer @tonia_ries @Citibank ‘scustomers are in a nightmare. Pity them. The bank planned this. They deserve bankruptcy. so well put, @Tinu . It was almost like I was watching maddie grant ‘s “Humanize” book come to life on stage. They locked the protesters inside the bank when they were trying to leave. How is that a rational response?”Please leave””No””Leave now or we’ll call the cops””No, I’m a customer of this bank””Leave or I’m calling the cops””Fine, I’m leaving””No it’s too late I called the cops and am now detaining you against your will for doing exactly what I asked of you, albeit in a slow and somewhat douchey manner”Yeah, that sounds completely reasonable to me. I like the fact that Eliason showed both videos but Citibank is trying to act as though they weren’t in the wrong. They locked protesters into their store and even dragged protesters from outside back in. Citibank’s response is so out of touch with what happened it’s unbelievable. Just because Eliason showed the video of them screwing up doesn’t mean they’ve handled the situation well. They haven’t apologized for unjustly arresting their own customers or supporting the use of force on non-violent protesters. Their response so far has been lying about the situation. I’ve watched all the videos and spoken with people who were there on the ground, almost everything Citibank has said in statements have been lies. @allenmireles How are you doing, Allen? I’m sleepy today. Trying to get motivated. @allenmireles That sounds nice! I have a two hour period of getting kids ready and to school on Wednesdays. Just finished. @allenmireles Thanks on the post! @BrandonChristopher sounds like you have some more details than can really be seen from either of the videos, Brandon, thanks for sharing your perspective. Personally, I always take a very skeptical view of any type of media coverage (Twitter, CNN or YouTube) – there’s always a bias and perspective. And I’m not sure there is a good way for Citibank to handle this situation well — but if they are serious about wanting a dialog, then I would give them credit for that. I’m interviewing Frank Eliason at Social CRM 2011 in New York on 3rd Nov. – so I expect this will be a topic of our conversation. If you want to come and listen – there are still tickets available (click the purple button ad in the right column above).